Note: the source code and test for this blog continue to evolve, but the changes to the text are not being maintained here. Please see the tutorial version for the most up to date content. In this article we continue our discussion of how to use Spring Security with Angular JS in a “single page application”. Here we show how to use Spring Session together with Spring Cloud to combine the features of the systems we built in parts II and IV, and actually end up building 3 single page applications with quite different responsibilities. 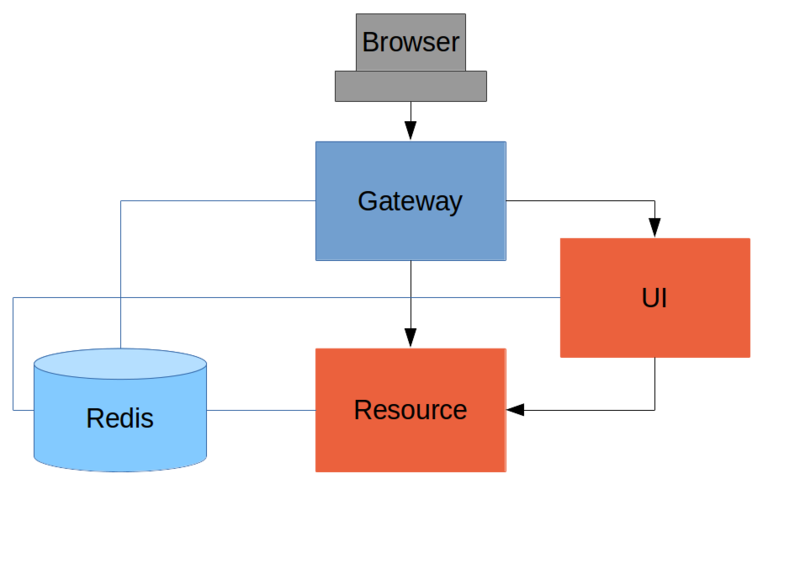 The aim is to build a Gateway (like in part IV) that is used not only for API resources but also to load the UI from a backend server. We simplify the token-wrangling bits of part II by using the Gateway to pass through the authentication to the backends. Then we extend the system to show how we can make local, granular access decisions in the backends, while still controlling identity and authentication at the Gateway. This is a very powerful model for building distributed systems in general, and has a number of benefits that we can explore as we introduce the features in the code we build. Reminder: if you are working through this article with the sample application, be sure to clear your browser cache of cookies and HTTP Basic credentials. In Chrome the best way to do that is to open a new incognito window. 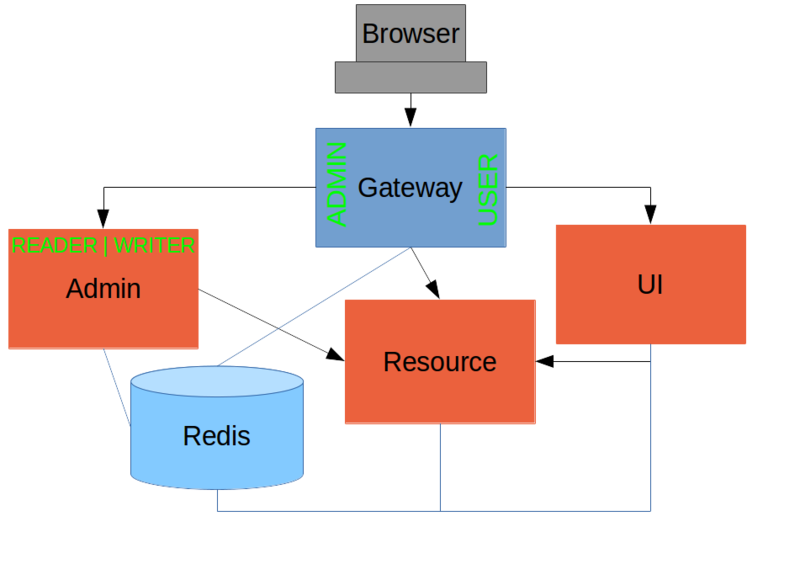 The browser goes to the Gateway for everything and it doesn’t have to know about the architecture of the backend (fundamentally, it has no idea that there is a back end). One of the things the browser does in this Gateway is authentication, e.g. it sends a username and password like in Part II, and it gets a cookie in return. On subsequent requests it presents the cookie automatically and the Gateway passes it through to the backends. No code needs to be written on the client to enable the cookie passing. The backends use the cookie to authenticate and because all components share a session they share the same information about the user. Contrast this with Part V where the cookie had to be converted to an access token in the Gateway, and the access token then had to be independently decoded by all the backend components. As in Part IV the Gateway simplifies the interaction between clients and servers, and it presents a small, well-defined surface on which to deal with security. For example, we don’t need to worry about Common Origin Resource Sharing, which is a welcome relief since it is easy to get wrong. The source code for the complete project we are going to build is in Github here, so you can just clone the project and work directly from there if you want. There is an extra component in the end state of this system (“double-admin”) so ignore that for now. Since this is now a UI there is no need for the “/resource” endpoint. When you have done that you will have a very simple Angular application (the same as in the “basic” sample), which simplifies testing and reasoning about its behaviour greatly. If that’s the whole content application.properties then the application will be secure and accessible to a user called “user” with a password that is random, but printed on the console (at log level INFO) on startup. The “security.sessions” setting means that Spring Security will accept cookies as authentication tokens but won’t create them unless they already exist. The completed sample is here in github if you want to take a peek. You can then import that project (it’s a normal Maven Java project by default) into your favourite IDE, or just work with the files and “mvn” on the command line. There is a version in github if you want to go from there, but it has a few extra features that we don’t need yet. There are 2 routes in the proxy, one each for the UI and resource server, and we have set up a default password and a session persistence strategy (telling Spring Security to always create a session on authentication). This last bit is important because we want authentication and therefore sessions to be managed in the Gateway. 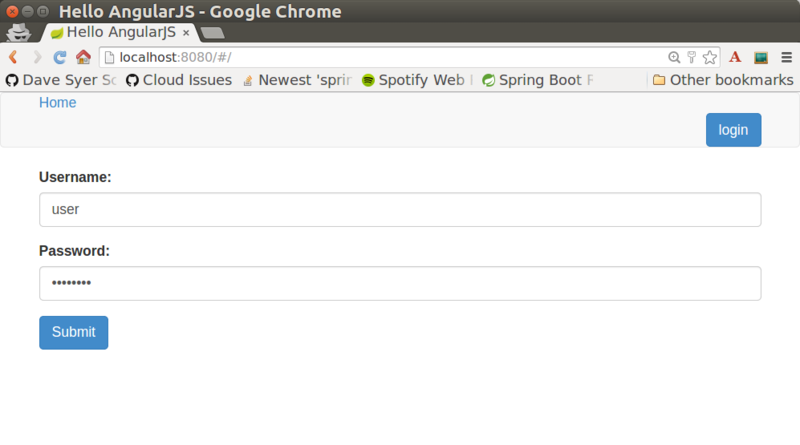 We now have three components, running on 3 ports. If you point the browser at http://localhost:8080/ui/ you should get an HTTP Basic challenge, and you can authenticate as “user/password” (your credentials in the Gateway), and once you do that you should see a greeting in the UI, via a backend call through the proxy to the Resource server. You might not see the 401 because the browser treats the home page load as a single interaction. 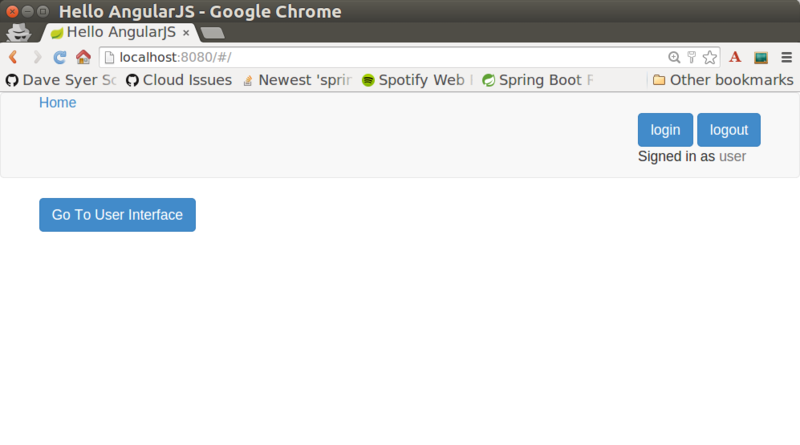 All requests are proxied (there is no content in the Gateway yet, beyond the Actuator endpoints for management). Hurrah, it works! You have two backend servers, one of which is a UI, each with independent capabilities and able to be tested in isolation, and they are connected together with a secure Gateway that you control and for which you have configured the authentication. If the backends are not accessible to the browser it doesn’t matter (in fact it’s probably an advantage because it gives you yet more control over physical security). We can use the $scope to store the authenticated flag because there is only one controller in this simple application. The fact that the existing UI is available to users in the “USER” role is indicated on the block diagram above in the Gateway box (green lettering), as is the fact that the “ADMIN” role is needed to go to the Admin application. The access decision for the “ADMIN” role could be applied in the Gateway, in which case it would appear in a WebSecurityConfigurerAdapter, or it could be applied in the Admin application itself (and we will see how to do that below). where the “admin” user has been enhanced with 3 new roles (“ADMIN”, “READER” and “WRITER”) and we have also added an “audit” user with “ADMIN” access, but not “WRITER”. Aside: In a production system the user account data would be managed in a backend database (most likely a directory service), not hard coded in the Spring Configuration. Sample applications connecting to such a database are easy to find on the internet, for example in the Spring Security Samples. Angular JS evaluates the “ng-include” attribute value as an expression, and then uses the result to load a template. Tip: A more complex application might use other mechanisms to modularize itself, e.g. the $routeProvider service that we used in nearly all the other applications in this series. the first thing the application does is look at the usual (for this series) “/user” endpoint, then it extracts some data, sets the authenticated flag, and if the user is authenticated, computes the template by looking at the user data. Now we have a nice little system with 2 independent user interfaces and a backend Resource server, all protected by the same authentication in a Gateway. The fact that the Gateway acts as a micro-proxy makes the implementation of the backend security concerns extremely simple, and they are free to concentrate on their own business concerns. The use of Spring Session has (again) avoided a huge amount of hassle and potential errors. A powerful feature is that the backends can independently have any kind of authentication they like (e.g. you can go directly to the UI if you know its physical address and a set of local credentials). The Gateway imposes a completely unrelated set of constraints, as long as it can authenticate users and assign metadata to them that satisfy the access rules in the backends. This is an excellent design for being able to independently develop and test the backend components. If we wanted to, we could go back to an external OAuth2 server (like in Part V, or even something completely different) for the authentication at the Gateway, and the backends would not need to be touched. A bonus feature of this architecture (single Gateway controlling authentication, and shared session token across all components) is that “Single Logout”, a feature we identified as difficult to implement in Part V, comes for free. To be more precise, one particular approach to the user experience of single logout is automatically available in our finished system: if a user logs out of any of the UIs (Gateway, UI backend or Admin backend), he is logged out of all the others, assuming that each individual UI implemented a “logout” feature the same way (invalidating the session). Thanks: I would like to thank again everyone who helped me develop this series, and in particular Rob Winch and Thorsten Späth for their careful reviews of the articles and sources code. Since Part I was published it hasn’t changed much but all the other parts have evolved in response to comments and insights from readers, so thank you also to anyone who read the articles and took the trouble to join in the discussion.